Is from Wantagh, New York and received his Bachelor of Science in Biology, with a minor in psychology, in 2008 from the State University of New York at Albany. Dr. Sood then completed his Doctorate in Dental Medicine from the University of Connecticut in 2012. 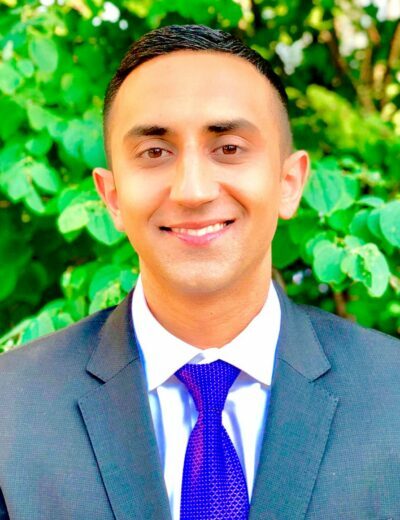 Upon completion of dental school, Dr. Sood was accepted into the highly accredited six year Oral & Maxillofacial surgery program at the University of Connecticut. During his residency, Dr. Sood earned a 2-year certificate in General Surgery, along with completing 6 months of anesthesia training. He also received his Medical Degree (M.D.) in 2015 from the University of Connecticut. He went on to serve as chief resident of the division of Oral & Maxillofacial surgery in 2017. During his residency training, Dr. Sood performed the full scope of Oral and Maxillofacial Surgery procedures, with emphasis on bone grafting and dental implant reconstruction, using the all-on-four approach for full arched fixed rehabilitation. He developed a particular interest in the administration of anesthesia, dentoalveolar surgery, craniofacial trauma surgery, reconstructive and corrective jaw surgery, oral and maxillofacial pathology, along with conservative and surgical treatment of temporomandibular joint (TMJ) disorders. Dr. Sood has lectured on various oral surgery topics at Connecticut society meetings and has taught dental and medical students via lectures and hands-on surgical anatomy courses. He has also co-authored several book chapters in facial cosmetics textbooks, as well as articles in peer-reviewed scientific journals. Dr. Sood aims to provide compassionate care with his knowledge of the latest techniques in surgery, anesthesia and pain management. He prides himself on steadfast dedication to ensure high-quality patient outcomes. He recently moved to Stamford, CT with his wife, Manasvi, who is a Physician Assistant (PA) in internal medicine. In his free time, Dr. Sood enjoys playing Basketball, swimming and spending time with his family and friends.